It's Rainy season and MyPhone is getting along with it. 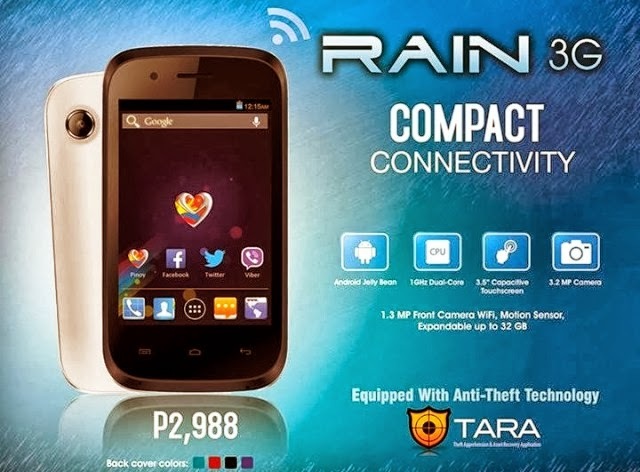 Releasing the Myphone Agua Rain, a phone featured with TARA (Theft Apprehension and Asset Recovery Application) first seen in Myphone Iceberg. One good catch about this phone is that its relatively cheap on its class, we could expect some compromises, but with regards to mobile brands MyPhone is definitely not the cheapest around. 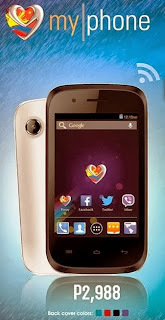 Myphone Rain 3G will boost entertainment at its best. Play around with 3.2MP camera, which is quite enough, especially on small smartphone screens. Not to mention, with the price of P2,988 you'll get that fast 3G connection, WiFi connection, GPS receiver, and wireless FM radio which you can listen to local free-to-air stations. What I like the most about Agua Rain is that it is actually running on Android Jellybean 4.2.2, plus the 512RAM which is enough to for most apps and games on PlayStore, I mean look at the price, and besides huge RAM (1GB and up) only gets the luxury of multitasking, keywords "same processor same speed". For Php2,988 (Suggested retail price don't be fooled), available now nationwide, specially on My|Phone Stores on key cities.